Each year the San Diego Volunteer Lawyer Program hosts a one-day community event that assists women in need. This year it will be Feb. 28, at Golden Hall in downtown San Diego. Photo via SDVLP.org. Since 1990, San Diego Volunteer Lawyer Program has been addressing the needs of homeless and low-income women and children in San Diego by organizing and overseeing an annual one-day event that provides free essential social, medical and legal services. 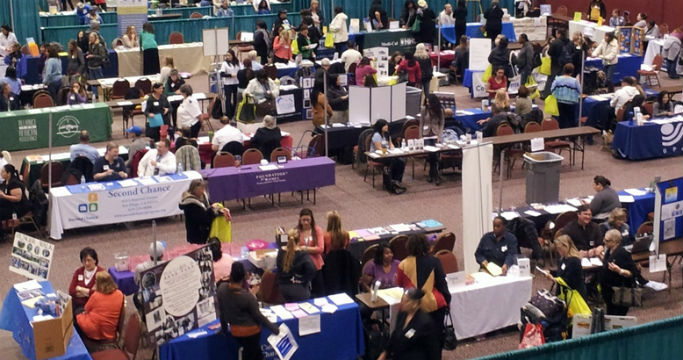 This year, SDVLP’s Women’s Resource Fair will be held from 8:30 a.m. to 1 p.m. Saturday, Feb. 28, at Golden Hall, 220 C Street in downtown San Diego. Up to 1,000 homeless, battered, and indigent women and children have been served each year. In 2014, more than 300 women obtained free medical services including mammograms, gynecological services, STD and HIV testing, and other screening services. More than 100 women received free legal assistance from volunteer attorneys involving family law matters, immigration, debt, housing, and other legal issues. Hundreds of women will meet with social services providers and receive shelter referrals, mental health provider referrals, and substance abuse help. Additionally, each woman will receive a free meal and a gift bag filled with donated toiletries and other items. Transportation to and from the event will be provided to some participants living in distant areas of San Diego County. Free childcare will also be provided. The Women’s Resource Fair Taskforce is currently assembling a team of 150 volunteers, and partnering with social services and medical organizations to provide services at the fair on Saturday. In addition, the task force is collecting monetary donations and donations of full sized new toiletry items to include in participants’ gift bags. To learn how to volunteer or where to donate, please visit www.wrfsandiego.org. SDVLP is a 501(c)3, non-profit organization and donations are tax-deductible.